Lately, I have been noticing that one side of the heated bed gets ample filament during printing process, while the opposite side doesn’t. What could be causing this? If it is only on first layer, it seems like a leveling issue. Meaning that either leveling is off or the bed is uneven for some reason. I found that the calibration with paper didn’t result in a good first layer. Corner #4 printed very thin and wide, while the other corners were thicker and narrow. It looked a lot like your picture. It caused problems when I tried to print something with a large solid first layer. While doing the bulk fill, the thin and wide lines would squeeze out, and force previous material off the bed. I ended up printing https://www.thingiverse.com/thing:2470157 (the 0.1mm one) a bunch of times. To start, I’d just print the inner and outer wall then cancel. Adjust the calibration, and repeat until the the lines looked even. Then I let the print run to completion, and I still had to lift that #4 one more step before I got a good print. Now when I check the calibration with paper, every point has a different amount of tension. Point #2, I can only pull the paper out. Point #4, I can slide the paper freely in all directions, with only the barest hint of friction from the nozzle. But my prints look a lot better. Yes, it does look like a leveling issue. The whole “paper calibration” technique is all too subjective. It would be nicer if there was some way to at least get some indication of pressure in the leveling process to take the subjectivity out of it. I think the problem is, especially when reaching inside an enclosure, your hand position changes for each corner, and causes you to use different muscle groups in your hands and forearms… so it is hard to get a sense for when the resistance of nozzle-on-paper is completely equal on all four corners. Best you can do here is to be aware of your hand/arm position and try to keep it consistent. The other problem is that paper thickness varies. The best you can do is make sure you always use the same kind of paper so you aren’t changing variables. What I do, is I run through the leveling twice… 1-2-3-4-, 1-2-3-4 – and some times cut the angle (1-4 or 2-3) just for reference if I don’t feel confident. I’ve found the paper should pull through with some resistance, but it should be very difficult to push it without crumpling or bending the paper. I’ve had pretty consistent results of late… I think it is just practice. But, as added insurance, you can always print on a raft, and that will help eat up any minute descrepancies in leveling. 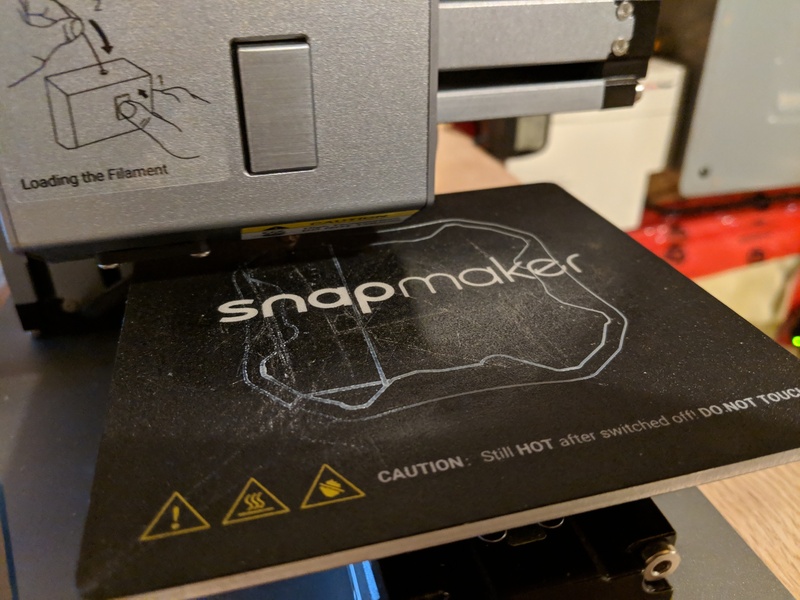 Found this on Snapmakers YouTube channel : What should I do if the first layer does not stick to the heated bed? 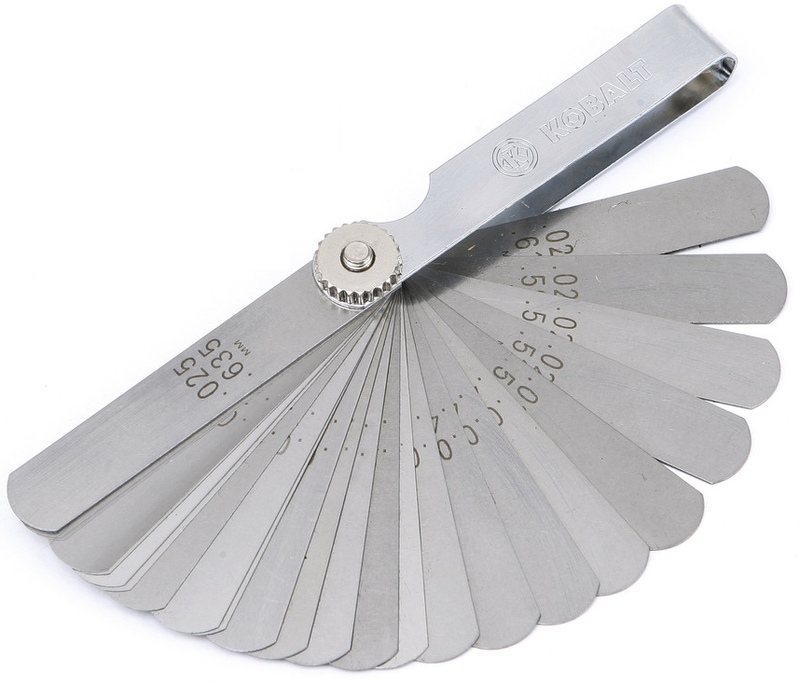 I cannot recommend this enough, but using a feeler gauge for calibration takes a lot out of the guesswork of “how thick should the paper be?” Credit goes to @doug for sharing his technique. I’ve seen this tips before (and I even added one of these to my “shopping” list), but as I’ve never seen/used one of these before, how should it be used? You do the 1-2-3-4 calibration, changing the z-axis until the nozzle touches the feeler? should it be able to slide (push?pull?)? I fear that it even with a consistent and rigid thickness the process would still require some guesswork, and prone to human error. The feeler, just as with the paper should not be “pinned” under the nozzle, but you should be able to feel a slight resistance. Also make sure your nozzle is free i.e. no protruding, hardened filament sticking out. I use a 0.05mm feeler. Paper is generally around 0.06m in thickness. I found that paper compresses and has a bit more resistance and can grab when sliding. This is not a precise science because you can adjust the print head during calibration to just touch the feeler or really press on the feeler. I like to have a firm feel when sliding the feeler back and forth. The main thing is consistency and to have the same resistance on all four corners when sliding the feeler. A little trial and error will get you there. I have had heaps of fun and many successful prints since then. Another thing to keep in mind is this will vary between different filaments. PET-G for instance doesn’t like to be “squished” as does PLA so you need slightly more distance. Using the provided calibration paper I usually set it so I can pull the paper through with resistance but can’t push it for PLA. For PET-G I can pull and push with slight resistance. This has worked fine for me. Thanks @doug and @BriHar for the additional tips! I’ll try it out once I get a set of feeler gauges. One thing I do in addition to the 1-2-3-4 calibration is I have a test print which does 4 laps around the edge of the bed and then I measure the resulting thickness of the print in each corner with digital calipers. That is the best validation that you’re set right. I got the feeler gauge and for the first time it seems that I was calibrating using something “scientifically reproducible”, even though there is still a human touch in the process. Really liked the idea of the perimeter printing + caliper measuring. If I face some 1st layer adhesion problem I will try to do it.